Our patients and their comfort are our first priority. Their time is valuable. My team and I work hard to make our patients feel valued and cared for. I believe I can help you impact your overall health to be the best. I apply evidence based dentistry which is a patient centered approach to treatment decisions which provides personalized dental care based on the most current scientific knowledge. My clinical quality is above the standard care. Dr. Ersan is a very skilled and respected dentist. She graduated from the University of Ankara School of Dental Medicine in 1988, and went on to receive a PhD in restorative dentistry at the University of Istanbul School of Dental Medicine in 1997 before starting her private practice in Istanbul. Upon moving to Rochester, she completed a two year advanced education in General Dentistry at Eastman Institute for Oral Health at the University of Rochester where she continued to serve as a part time faculty member . 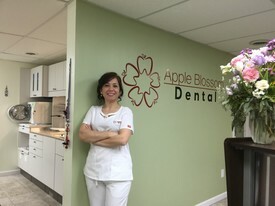 Additionally, she has served as an associate dentist and managing clinical director in dental practices in the Rochester area for twelve years. She completed dental seminars and classes to keep her knowledge up to date. She is a member of the ADA, NYSDA, MCDS and the Seventh District Dental Society. She lives in Webster with her husband,Mehmet and their twin daughters,Elif (17), Irem (17), and their son, Sinan (16). She loves spending time with her family and friends.